By combining new educational facility and recreational afterschool club for more than 500 children in Camden, a community-focused, environmentally friendly revitalization project serves as a national model for what can be achieved with good local and regional planning. The Octavius V. Catto Community School and Boys & Girls Club of Camden County is a cornerstone in the effort to revitalize the surrounding Rosedale-Dudley Neighborhood in East Camden, where one-third of all residents live below the poverty level. 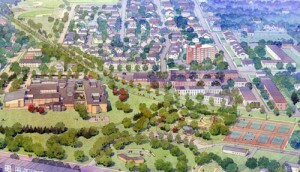 In addition to providing state-of-the art educational facilities, the project will upgrade and redevelop the existing Dudley Grange Park, provide a new park adjacent to the HOPE VI Baldwin’s Run housing development, and build a community center at the site of the former Stockton Station Apartments. A rails-to-trails project on the former Conrail Line will connect the two parks via a greenway. Octavius V. Catto (1839-1871) was an outstanding scholar, teacher, civil rights activist, and sportsman of African-American descent from Philadelphia. During the Civil War, he worked with Frederick Douglass and other prominent black leaders to recruit young black men to defend the Union. He was a member of a number of civic, literary, patriotic, and political groups, including the Franklin Institute, the Philadelphia Library Company, the Fourth Ward Black Political Club, and the Union League Association. A major in the Pennsylvania National Guard, he was killed by a street gang on his way to help quell a riot caused by a group of white men who were attempting to prevent black men from voting. Scheduled to open in August 2007, the Catto Community School will serve students from nearby neighborhoods, ranging from pre-kindergarten through sixth grade, while the Boys & Girls Club will cater to children from kindergarten through eighth grade. The building has two separate entrances, with shared spaces in between that feature a pool, an auditorium, a cafeteria, and a multi-purpose gymnasium. The project was built to high LEED-level building standards, relying on sustainable materials. Facilities, such as the auditorium and library and media center, will be accessible to the public, along with the Baldwin’s Run community center. The project was a result of a collaboration that began when the Catto and Davis Elementary Schools and the Boys & Girls Club saw the need to expand and update their facilities. As one of the state’s six demonstration projects, the Catto project serves as a national model for integrating schools and communities. Government agencies at the state, county, and local levels successfully coordinated with private-sector planners and developers. Throughout the planning process, public participation was encouraged by the Camden School District, supported by the Camden Redevelopment Agency, and facilitated by Hillier Architecture, which led the project through the four-year process. The combination of school and after-school facilities offers children more extensive supervision than either could provide separately, as well as additional education in making healthy choices for a mentally and physically active life. The complex also has had a positive impact on the neighborhood—more than 250 affordable and market-rate housing units are currently under construction; new employment opportunities are being offered in a nearby industrial park; storefronts in the area are being rehabilitated; and plans are under way to redevelop a nearby General Color Superfund site.